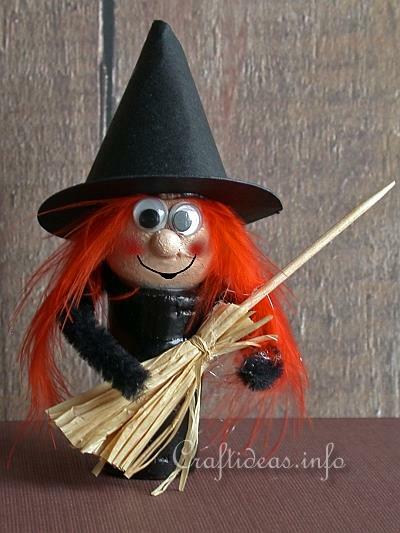 This witch is not interesting in scaring the children at Halloween but would rather have a nice spot on a shelf. Kids will have fun making her out of wine cork and other basic craft materials. This project needs a little bit of time to dry, but is otherwise a fast and easy craft. 1. Paint the cork black and set aside to dry. 2. Paint the styrofoam or paper ball in flesh color and set aside to dry. 3. 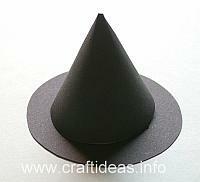 Create a witch hat by following the instructions above in the step-by-step pictures. 4. Glue the wiggly eyes on the face. 5. Be careful for this step. Use scissors and “cut” the wooden ball in half. 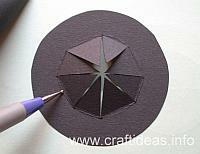 This is done by placing the scissors over the middle over the hole and pressing down. This will split the wooden ball in half. 6. Paint the wooden ball with the flesh color and set aside to dry. 7. Dry brush the cheeks with red paint. This is done by dipping a stiff brush in the paint and wiping the paint off onto a paper towel until almost no more paint comes off the brush. Then pounce the brush onto the cheeks. Continue until the intensity you want is achieved. 8. Use the fine liner marker and draw a mouth onto the witch. 9. Glue the head onto the body body. 10. Glue one orange feather onto the side of the face so that the soft part of the feather is facing down. Cut away excess feather at the top of the head. 11. Now do the same with the second feather. 12. Glue the hat onto the head. 13. Glue the nose onto the face. 14. Glue a piece of chennile from the backside of the witch at the neck line so that the chenille ends are at the front. 15. Create a broom by gathering a few pieces of raffia together. Tie off at one end. Place a drop of glue to one end of the toothpick and insert it into the bundle at the tied off end. 16. 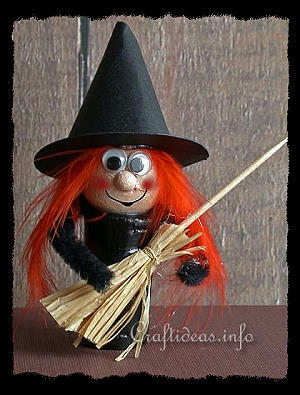 Hot glue the broom to the witch’s hand. 1. To make the hat, print out the patterns. Form the a cone out of the half circle shape. Cut the dotted lines on the circle shape. 2. Take the stylus and score the space between the “pie” pieces. 3. Bend the “pie” pieces upwards. 4. 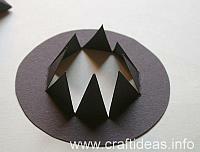 Place glue on the outside of the pieces and then place the cone shape over these. Press these pieces inside of the cone and let dry. 5. This is how the finished hat looks and is ready to use for the witch. Copyright: Please read the information here about the copyright of this website.